As in humans, your pet’s liver is one of the largest organs in its body and it performs many life essential functions. With Denamarin 225mg you can protect liver cells of your pet from dying and is helpful in cell repair and healing. Denamarin for Dogs 13-34 lbs, 30 Tablets (Green) is a nutritional supplement for dogs with Silybin milk thistle extract and S-Adenosylmethionine (SAMe) that supports liver function. Denamarin for Medium Dogs supports healthy liver function and aids in digestion by increasing bile flow. Denamarin is a patented nutritional supplement for dogs and cats by UTRAMAX LABORATORIES. This pet supplement combines a pure and stabilized S-Adenosylmethionine with silybin-phosphatidylcholine complex. You can order the liver supplement for pet and other prescription drugs for pets at pet drugs online shop. At our Texas based pet pharmacy online, we offer quality pet prescription medication for your beloved pet. 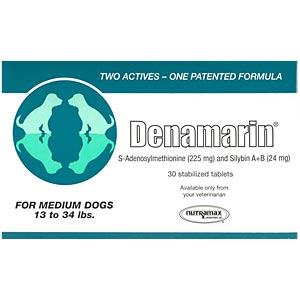 Denamarin is available in three convenient sizes: Denamarin for Cats and Small Dogs, which contains 90 mg of S-Adenosylmethionine and 9 mg of silybin A+B; Denamarin for Medium Dogs, which contains 225 mg of S-Adenosylmethionine with 24 mg of silybin A+B; and Denamarin for Large Dogs, which contains 425 mg of S-Adenosylmethionine and 35 mg of silybin A+B. As S-Adenosylmethionine is sensitive to moisture, the enteric-coated tablets are individually sealed in specialized moisture-resistant blister packs. S-Adenosylmethionine is an endogenous molecule synthesized by cells throughout the body and is formed from the amino acid methionine and ATP. It is an essential part of three major biochemical pathways: transmethylation, transsulfuration and aminopropylation. As part of these pathways, S-Adenosylmethionine is essential to all cells and is particularly important in hepatocytes because of their central role in metabolism. A deficiency of S-Adenosylmethionine, therefore, may initiate or contribute to abnormalities of cellular structure and function in the liver as well as many other body tissues. The best way to increase S-Adenosylmethionine levels in the body is by direct supplementation with S-Adenosylmethionine. Silybin is the most biologically active component of milk thistle extract known as silymarin, and its absorption is enhanced by phosphatidylcholine. Silybin/silymarin has been shown to have healthy liver function and prevents liver problems in dogs and cats. The combination of S-Adenosylmethionine and silybin in Denamarin provides a multi-faceted approach to liver support. S-Adenosylmethionine has been shown to increase hepatic glutathione levels in cats and dogs. Glutathione antioxidant protects hepatic cells from toxins and death. Denamarin is recommended to improve hepatic glutathione antioxidant levels in patients to help maintain and protect liver function. Denamarin may also be used in other areas of tissue oxidant injury and RBC fragility caused by certain toxins or drugs which are related to reduce glutathione concentrations. Denamarin mechanism of action, however, goes beyond increasing glutathione antioxidant levels, in that S-Adenosylmethionine has also been shown to protect liver cells from cell death and may be useful in cell regeneration. The ingredients in Denamarin for dogs possess exceptionally wide margins of safety. Oral acute toxicity studies in rats indicated an LD50 greater than 4,640 mg/kg for S-Adenosylmethionine. Clinically healthy dogs administered 20 mg/kg/day of S-Adenosylmethionine for 6 weeks and clinically healthy cats administered S-Adenosylmethionine at 2 times the recommended daily amount for 113 days remained healthy with no adverse effects from the administration. There are no known drug interactions or contraindications to the use of silybin/silymarin in animals. While mild side effects, such as gastrointestinal upset, itching and headache, have been rarely reported in primates, no side effects have been noted in dogs or cats. The specific silybin-phosphatidylcholine complex in Denamarin for dogs has been evaluated in both acute and chronic use safety studies: an acute toxicity study in dogs using levels greater than 80x the amount in Denamarin revealed no adverse physiologic effects, and a chronic toxicity study in monkeys who received greater than 80x the amount in Denamarin for 26 weeks showed no compound-related adverse effects. Please follow the administration charts below as a guide. *The number of tablets can be gradually reduced or increased at any time depending on the pet’s needs. Many pets are maintained long-term on every-other-day or every-third-day administration. For optimal absorption, the tablets for dogs should be given on an empty stomach, at least one hour before feeding, as the presence of food decreases the absorption of S-Adenosylmethionine. 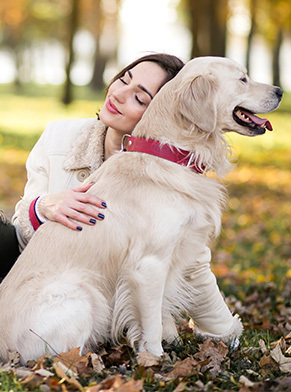 Denamarin for dogs can be used in conjunction with Marin® to provide additional silybin levels and the benefits of vitamin E and zinc supplementation. If Marin is used in conjunction with Denamarin, the two products should be administered 12 hours apart for best response. Store this liver supplement for pet in a cool dry place not to exceed 86° F. Keep tablets in original blister pack until used. Tablets for dogs are sensitive to moisture and extreme heat and should not be split or crumbled.